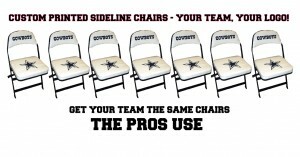 Sideline Chairs Get the Same Chairs the Pros Use! Your team or school can have the same chair the pros use….not some cheaper “knock off” brand made overseas. Clarin by Hussey Chairs are the industry leader in sideline chairs, chairs for athletic events, and locker rooms. At Athletic Seating, we can give your school the quality look and comfort of the top of the line logo seating, and at a fraction of the price other places offer. How?…by saving our customers needless upcharges along the way because we do the all the layout, artwork and printing ourselves. We’re not some middleman broker who just sells chairs. We are the only dealer who can say that. And since we do it ourselves, we can pass substancial savings on to you….and your team! Go ahead, get a quote on the same sideline chair, locker room chair, stool or slip cover from another dealer…then call us. You’ll see for yourself.